The concept of the story is very intriguing. A widow running a champagne house in a world of men uses her wits and hard work to outmaneuver them all and claim supremacy in the champagne market of the early 1800’s. This part of the wine book which unfortunately only covers 28 pages is indeed interesting and very well told bringing the suspense and climax it deserves. It’s the other 163 pages that we find lacking and drawn out. 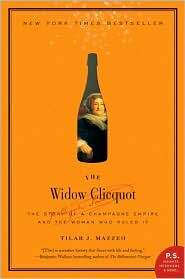 The author readily admits the lack of documentation of the Widow Clicquot’s personal life which forces her to assume and conjecture far too often. “I expect…,” “She surely must have…” are just two of the many example. The majority of the book is then rather uneventful as the author is forced to create a story where none exists. The adages regarding champagne history and production are interesting but only add to the length of the book rather than to the context of the story. If you are looking for a light read on Champagne and one of its most famous names then this wine book is for you. If you are looking for something more substantive and focused then don’t waste your time.